Smoking inhaling cocaine. Inhalation or smoking is one of the several means cocaine is administered. Cocaine is smoked by inhaling the vapor by sublimating solid cocaine by heating. In a 2000 Brookhaven National Laboratory medical department study, based on self reports of 32 abusers who participated in the study,”peak high” was found at mean of 1.4min +/- 0.5 minutes. Smoking freebase or crack cocaine is most often accomplished using a pipe made from a small glass tube, often taken from “Love roses,” small glass tubes with a paper rose that are promoted as romantic gifts. These are sometimes called “stems”, “horns”, “blasters” and “straight shooters”. A small piece of clean heavy copper or occasionally stainless steel scouring pad – often called a “brillo” (actual Brillo pads contain soap, and are not used), or “chore”, named for Chore Boy brand copper scouring pads, – serves as a reduction base and flow modulator in which the “rock” can be melted and boiled to vapor. Crack smokers also sometimes smoke through a soda can with small holes in the bottom. Crack is smoked by placing it at the end of the pipe; a flame held close to it produces vapor, which is then inhaled by the smoker. The effects, felt almost immediately after smoking, are very intense and do not last long – usually five to fifteen minutes. When smoked, cocaine is sometimes combined with other drugs, such as cannabis, often rolled into a joint or blunt. Powdered cocaine is also sometimes smoked, though heat destroys much of the chemical; smokers often sprinkle it on cannabis thereby lacing the weed with cocaine. 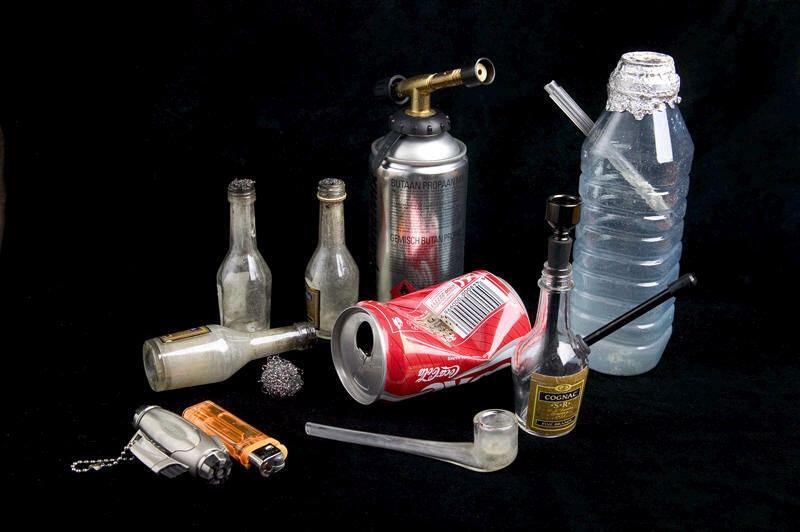 The language referring to paraphernalia and practices of smoking cocaine vary, as do the packaging methods in the street level sale. If you live in an area with lots of users, you’ll find the paraphernalia laying out on the street.